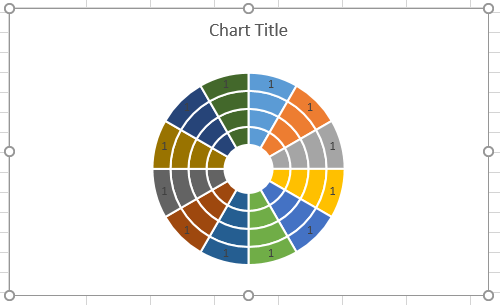 A while back I developed a solution to a Chandoo.org Forum question, where the user wanted a 4 level doughnut chart where each doughnut was made up of 12 segments and each segment was to be colored based on a value within a range. This post will examine the techniques I used for the solution. 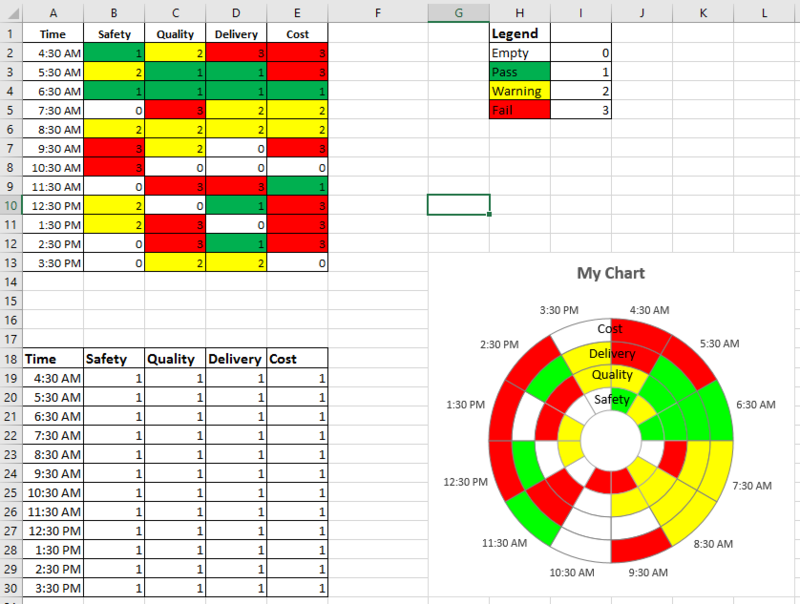 The first thing to note is that there are 4 column of data, one for each measure of Safety, Quality, Delivery and Cost. Secondly is that each measurement has 12 values representing the times from 4:30 am to 3:30 pm. We now have a basic Doughnut chart with all the facilities we require. 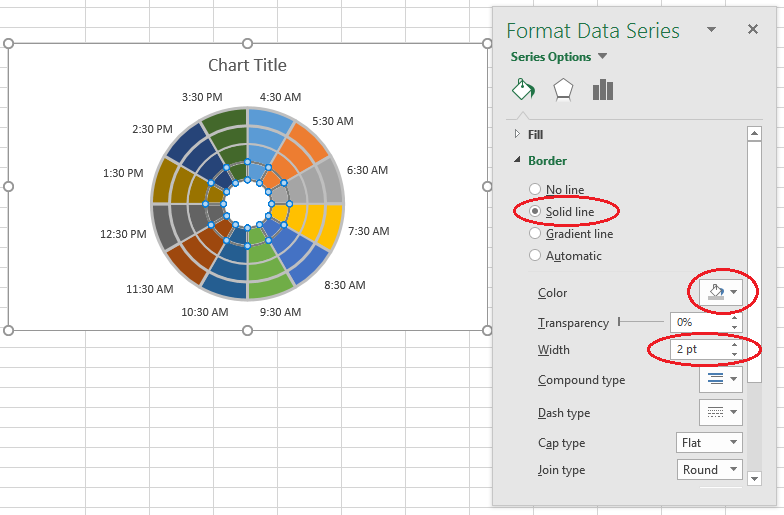 Unfortunately, Excel doesn’t have a built-in Conditional Formatting option for charts. So we will need to develop a system using some simple VBA. 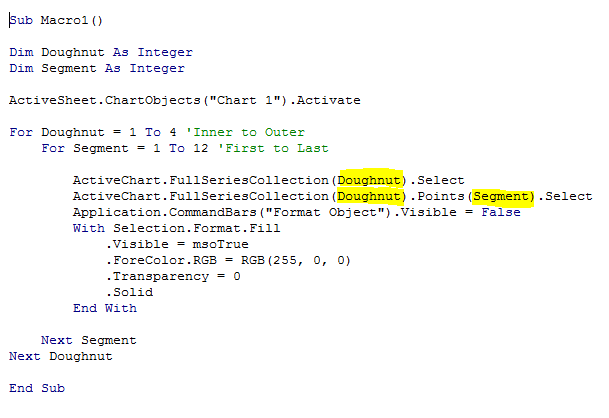 Repeat with the outer Series and you will see that Doughnut 4 is connected to the Cost Data and is series 4. So we understand that the series go from Value 1 to 4, Inner to Outer Doughnuts and that the segments go from value 1 to 12 clockwise, starting to the right of 12 O’Clock. 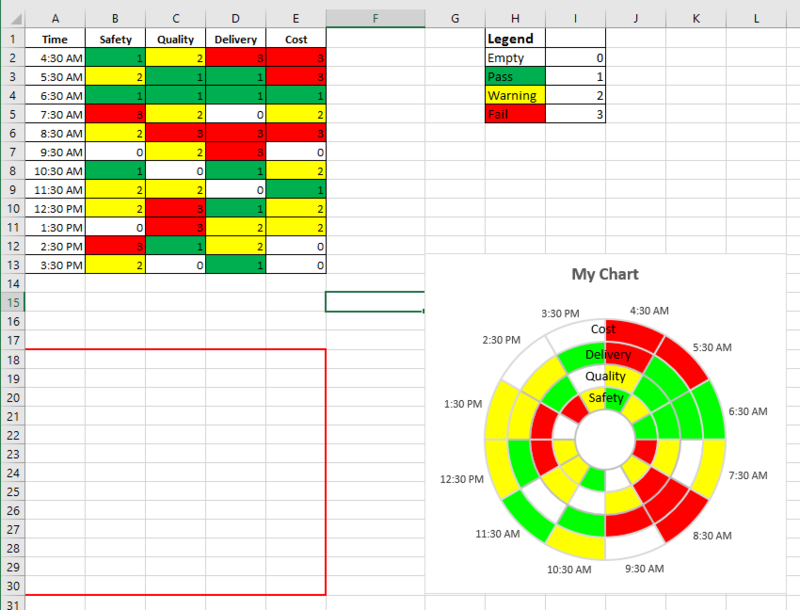 Finally select the Chart and make note of it’s name. Take note of the above. 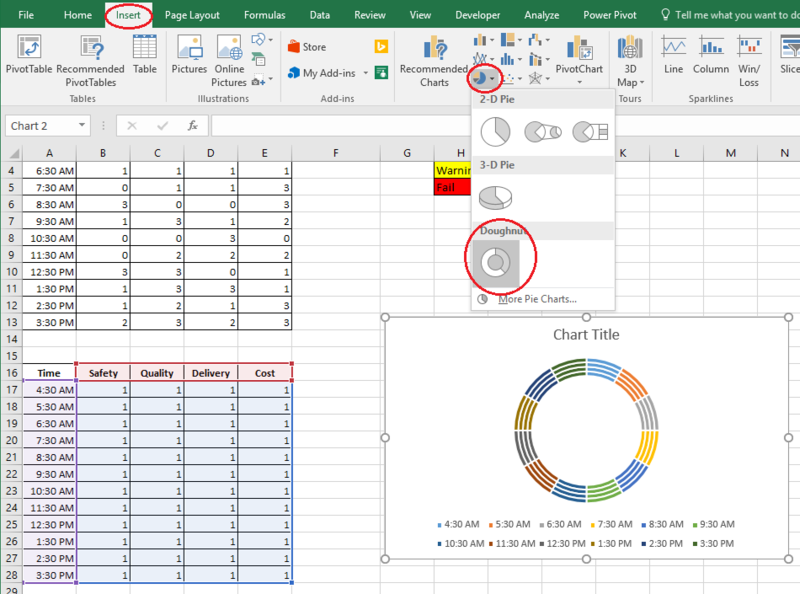 We can see that we have a Macro1 subroutine, located in Module 1 of our Excel file. If you can’t see a Properties or Immediate window, don’t worry. We have setup two loops, one for the Doughnut which will loop from 1 to 4 and a second loop for the Segment, which will loop from 1 to 12. 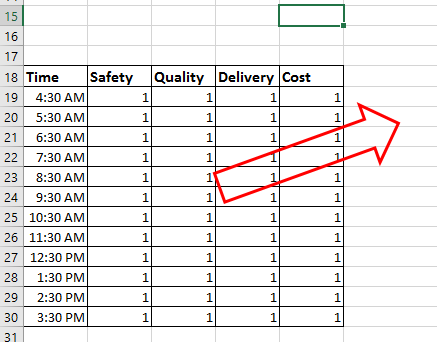 The next thing is to add lines to lookup the value of the measure in the original data table. I have added a new variable declaration myVal and declared it an Integer as it is only storing the values from, 0 to 3. 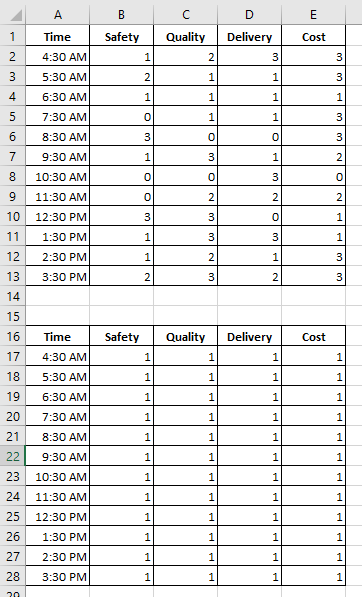 Then we retrieve the value from the data area by using a Range(“”).Offset(Row,Column) combination. We know that the segment loops from 1 to 12 and this is the Row Offset in each Doughnut. 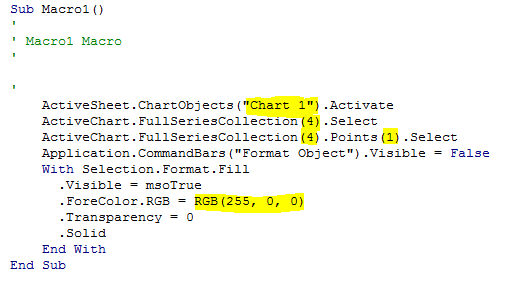 We could loop from a value of 0 to 3 and check the new variable myVal against each value and set the color. 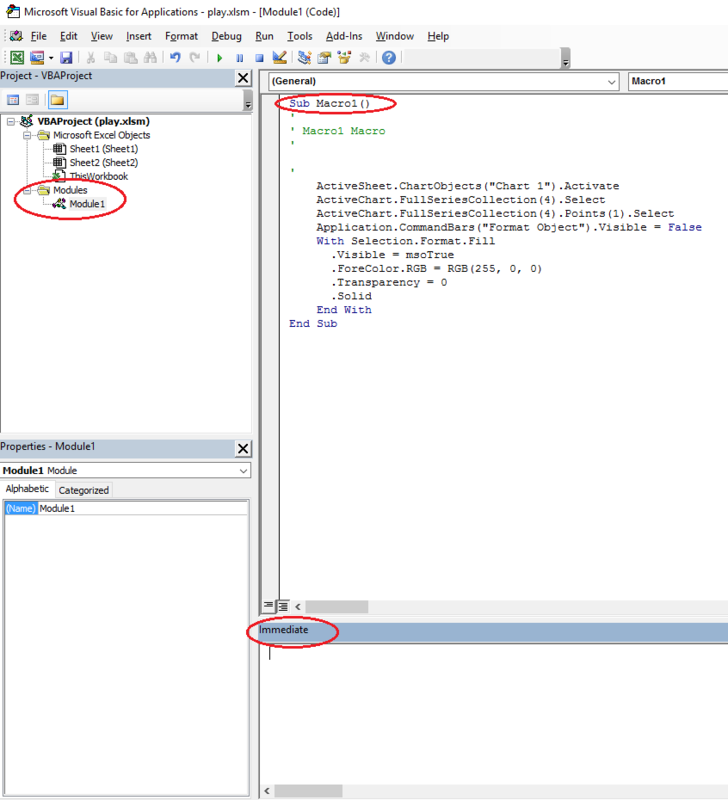 Note above that the code is now located in a Private Sub Worksheet_Change event. 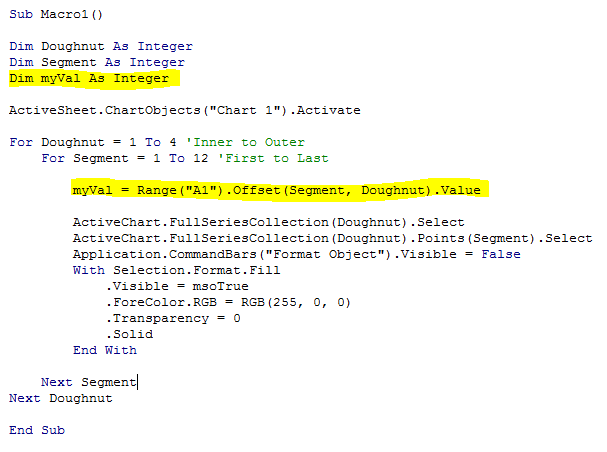 This means that the code runs whenever worksheet1 chnages. 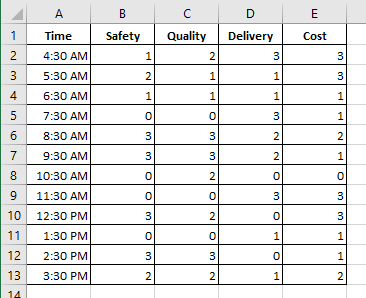 Checks whether the cell that changed was not part of our Data Area or that multiple cells were selected. 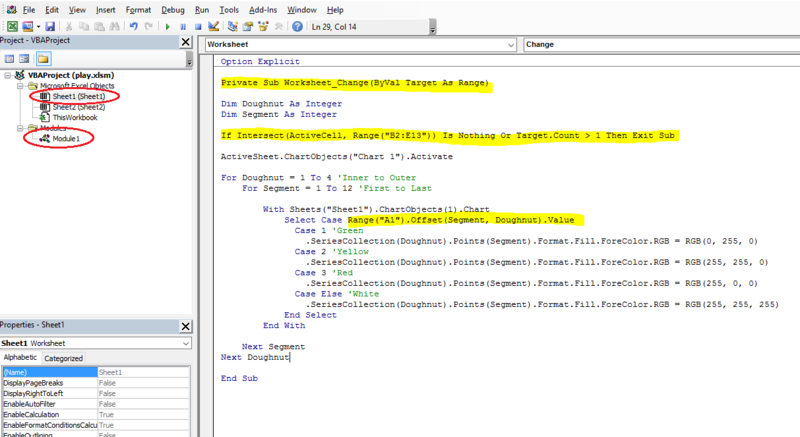 Then finally I removed the MyVal calculation and made it part of the Select Case function. 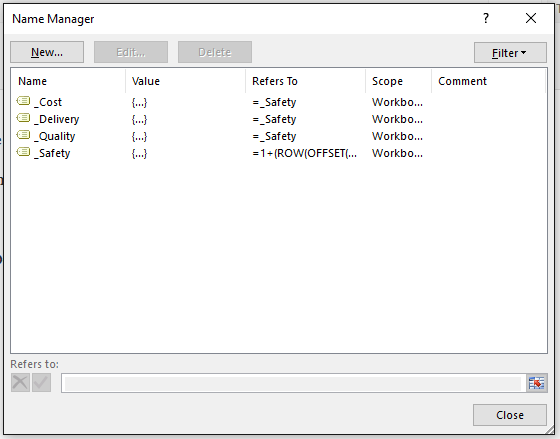 We can now also remove Module 1, right click on it and Remove Module. Can we tidy up the layout of the worksheet? 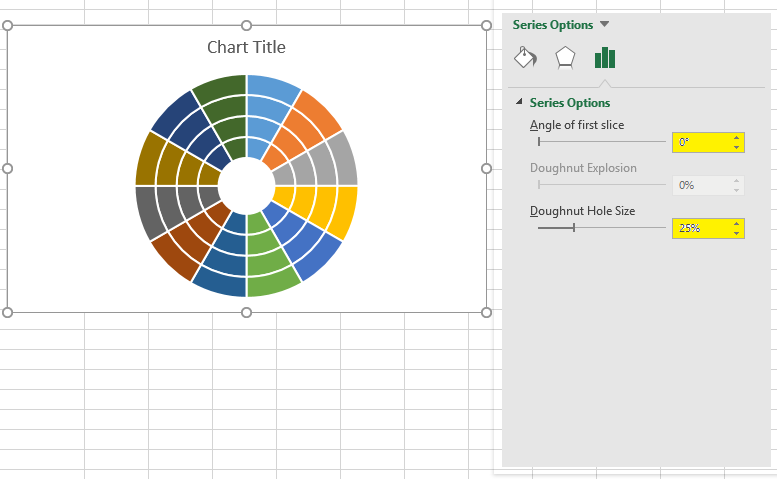 Although we now have a fully functional model, we are stuck with an ugly worksheet layout because our template of 1’s is being used to support the framework of the 4 Doughnuts in the chart. What if there was another way to achieve that? 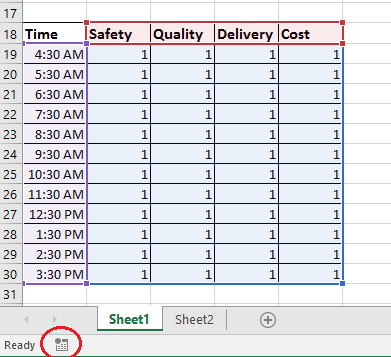 Firstly, we could simply shift the range A18:ER30 well away from the Chart and data area or even move it to another worksheet. The 4 Names now contain an array of 12 x 1 each with a value 1. 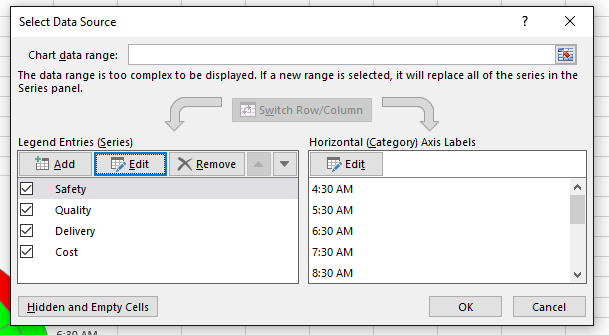 Change the Series Name to Row 1 and insert the Names into the Series values dialog. 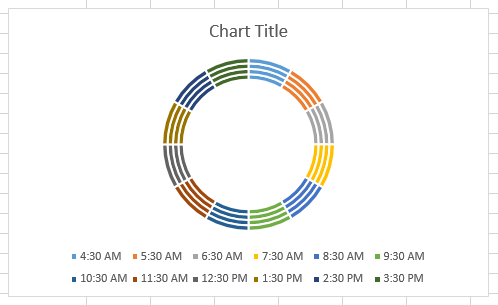 Change some values in the Data range at the top and the Chart updates as it should. 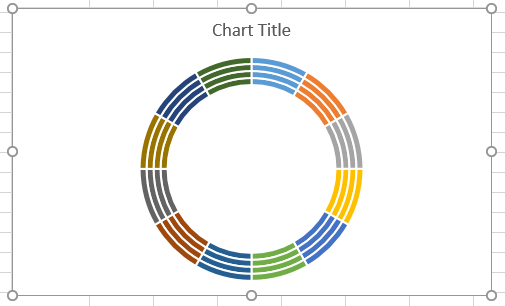 The technique applied to the doughnut chart above can fairly easily be modified to any chart type or in fact any other shapes. ps: This has been one of my hardest posts to write, simply because Microsoft has misspelt Doughnut. In my native Australian English it is Donut. What are some real world examples where such charts are used? To me this is part of a dashboard showing radially the progress of a measure against time. And linearly the snapshot of 4 measures at the same time. The OP never explained the requirements/use. The doughnut chart doesn't add value here. This could be a table, where each column would represent Time. 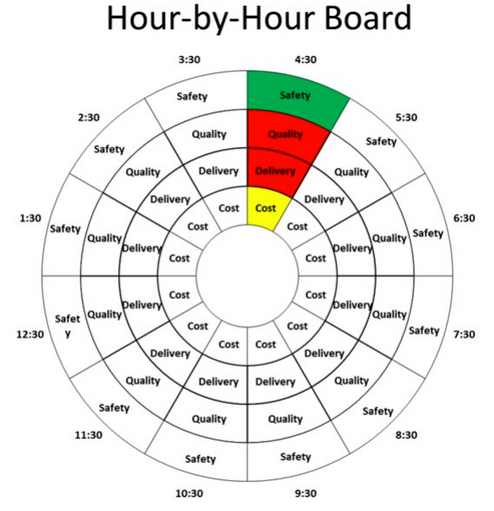 It is easier to track rows trough time then to go around the doughnut chart. 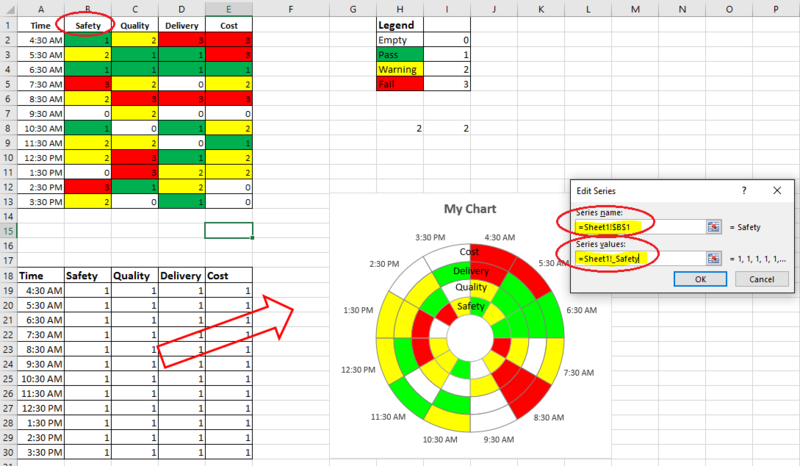 If you read the original post, I offered exactly what you quote, a Column Chart. Having used this chart now for a few weeks, I find it naturally really easy to work with. This seems like a lot of effort that results in a very confusing chart. This is a novel way of representing data. And the coolest and most difficult one I have seen. is actually not required. Commenting this out still updates the chart. Awesome work, as always, Chandoo! 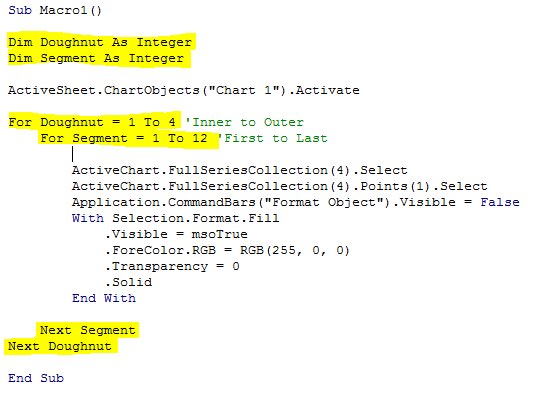 This is interesting, but I got lost w/VBA portion. 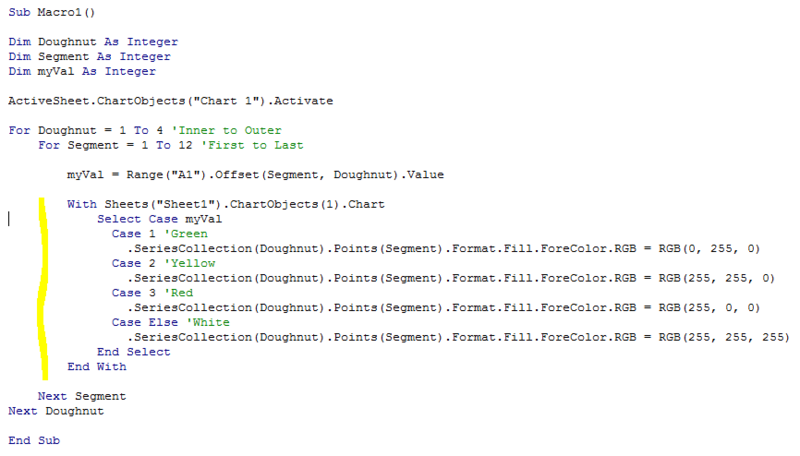 I have no knowledge of VBA. I was a little unsure as to when you would use this doughnut chart, but it was good read, to enhance critical thinking on how to visualize data. Thank you! In this chart every wedge is the same size, they are markers for a particular time, they are not being used to compare measurements as a pie chart does. As a dashboard I have come to like this layout. As I said in the post the post is about the techniques used to get the result, how you use or don't use these techniques is entirely up to you. Excellent post Hui, thank you, I for one am always looking for new and innovative ways to utilise these types of chart. 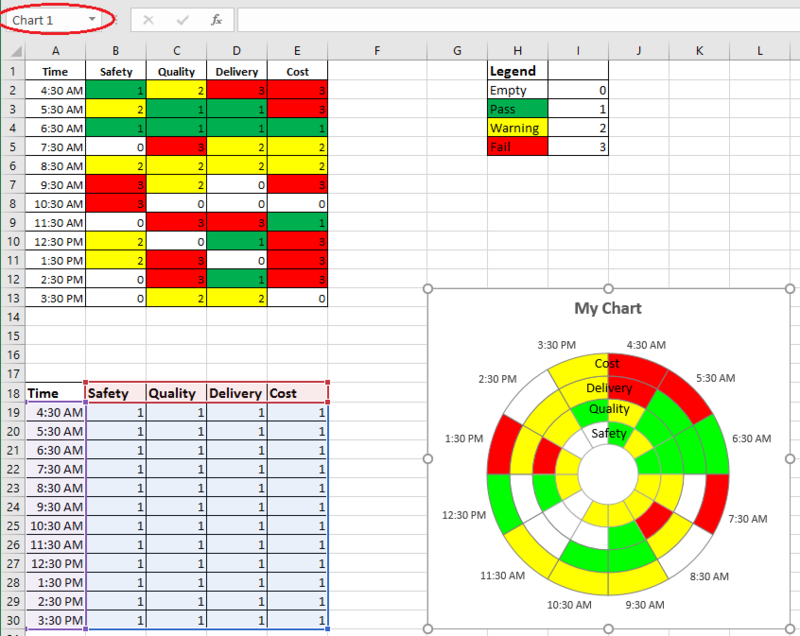 As a BI developer, I prototype dashboards in Excel before incorporating into a given BI platform such as SAP, Microstrategy, SSRS, etc. There are 2 instances where I'm requiring to use doughnut and pie charts. The first is when an external client insists on having them, regardless of opinion on their efficacy or the gospel according to Stephen Few. 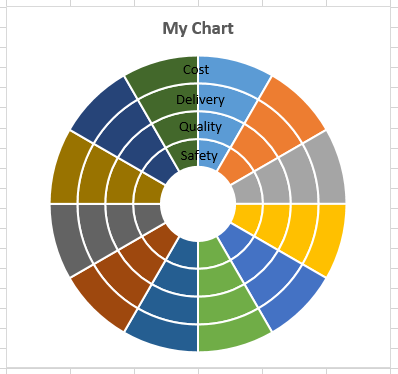 The second use is when I'm asked to create visually engaging dashboards with an emphasis on 'eye candy'; Chandoo (12 Apr 2013*) wrote an excellent blog on the dangers of such charts, demonstrating how 3d Pie charts could 'hide' specific insight. * Chandoo, 12 Apr 2013, 'Some charts try to make you an April fool all the time (or why 3d pie charts are evil)'. Thanks Hui! This can be used to represent the site KPI metrics. Gold! A 3D Warehouse Heat Map in MS Excel (by Adrián Chiogna).